I don’t as a general rule post my own poems on my blog. but now and again, but not too often, do I break that rule! As I have done today. 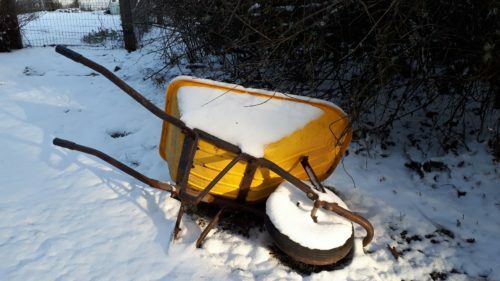 First I couldn’t resist the picture of the wheelbarrow this past Monday after a light snow. The image blazed up at me as Tomas Transtromer says in one of his poems. Then, I sent the image to some friends. One asked when I was going to write a poem to accompany it. And then with W.C. Williams, of course, in mind when it comes to wheelbarrows, off I went to write something. This entry was written by Richard Osler, posted on February 7, 2019 at 4:11 pm, filed under Poetry and tagged Richard Osler. Bookmark the permalink. Follow any comments here with the RSS feed for this post. Love it. Yellow on yellow, indeed! Good all sunshine yellow! Sending you much love! Glad you posted this poem. Love it!